I'm home from Ohio, but was sad to leave my little Mama. Not only did she break her right shoulder, but she also had pneumonia. Luckily, the doctor's office that he goes to, has a doctor that does home visits, and nurses and aides that come throughout the week. It's hard to believe in this day and age, isn't it? Let's enjoy some date and nut bread, which is my mom's favorite, and which I baked for her while I was there. I am hoping that my friend, Lynn, from Happier Than A Pig In Mud, will try this recipe sometime. I have shared the recipe before, and wanted to share it again, with the printed format. This Clarence teacup is one of my most favorite wintertime ones to use. I always look forward to sipping tea from it. My teapot that my sister gifted to me several years ago blends nicely with the teacup and the pretty plates that I found at a flea market for 25 cents. The little sledding boy and girl were given to me by my dad years ago. Aren't they sweet? I have been making this bread since I was in high school, and it's a family favorite. Combine nuts, dates. soda and salt in a mixing bowl. Add the shortening and boiling water. Allow this mixture to stand for 15 minutes. Stir to blend. Beat the eggs slightly, add vanilla. Stir in the sugar and flour. Add this to the date mixture. Do not over mix. Place in a greased 9x5x3-inch loaf pan. Bake for 1 hour in a 350 degree oven. Cool before removing. NOTE: If making mini loaves, check to see if they're done at around 30-35 minutes. Sometimes I like to make date and nut bread by using my mini cottage bundt pan. I sprinkled some powdered sugar on top for that snowy effect. That sounds delicious, Kitty. I am so sorry your mom got hit with a double whammy and hope she recovers fully and that she is healed quickly. Sure hope your Mother will recover soon. Thanks for putting the link to print for the recipe, it went right to my printer.It printed your whole post though. How do you put it on? Oh dear, your poor mother, how old is she? That is wonderful she can have the Dr come to her house. What a smart idea to bake your bread in a cute mold! It looks so cute sprinkled with snow! 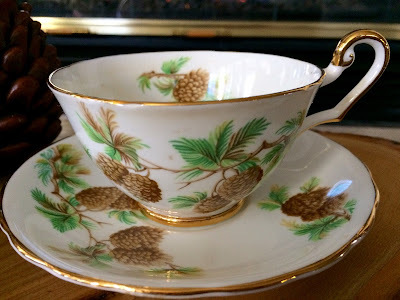 Cute pine cone china...you should open a tea room with all your yummies and pretty tea things! Your teacup is just gorgeous!Love the sweet figurines and love your mouthwatering dessert!I will pray for your Mom's recovering.Blessings,dear Kitty! Welcome back Kitty - I'm sure it was hard to leave her but I know you're glad to be back where it's warm! This sounds like such a wonderful, comforting snack. I've never made date nut bread and not sure I've even eaten it before? How is that possible?? Definitely want to try this! Thanks for sharing! The bread looks delicious, Kitty. I'm pinning it. I hope your mom is feeling better and can enjoy her loaf. So good that your mom can have home visits from the doctor and nurses/aides. That helps so much when older folks don't have to go out for appointments. I love the pine cone cup and saucer, the plate and the teapot! I pretty much have a weakness for anything adorned with pine cones and branches! I have a plate very similar to yours that I found at a thrift store out west. And your date-nut bread is very similar to a recipe that I have. In the recipe newsletter where I found the recipe, it was suggested to heat orange juice and substitute it for the boiling water. It is fantastic that way. I highly recommend trying that substitution if you never have. Happy to find you here. So sorry that your precious mother has had these trials to deal with. I am glad that she has a good doctor who makes housecalls—really like time travel back to simpler days. Hmmm...date bread is so delicious and real comfort food. Your mother must surely have enjoyed it. Welcome back, Kitty! I'm glad that your mom is getting the medical attention that she needs. It's nice to hear that there are still some doctors that makes house calls. So thankful you had safe travels! Praying blessings for your mama! Know that I thought of you often and looked forward to seeing your next post! This bread sounds scrumptious! I love the pine cone setting! Perfect!! Oh yum....I haven't had piece of date nut bread for years. When we were first married, I got a recipe from my MIL and baked them in coffee cans and gave them for Christmas gifts one year. So nice that you were able to visit your sweet mama...I hope you had a great visit up in COLD country! HUGS! Welcome back home, Kitty! It is wonderful your mother's doctor makes home visits- such a needed aspect of health care. I wish it were more common. Sending healing thoughts to your mother. I'm back from my blogging break and so happy to check back in with you. I really enjoy baking breads and never tried one before with dates in it. So naturally sweet and delicious! Thanks for sharing. Glad your mom is on the mend. My mom and aunt loved date nut bread. This is a recipe I would try. The cottage pan is so sweet too. I continue pray for you and your precious, little mother every, single day, sweet friend. I am so thankful you are home safe. I know how awfully hard it is to leave a mother and be so far away...the pain is hard. I miss my dear, sweet Mom so much, it literally hurts, at times. It will soon be 6 years since Jesus called her home, and I tell you, I think it hurts as much today as it did the day she died. So thankful you could spend that precious time with your Mom, and I trust Jesus will heal her completely and give her many more years with you, sweet friend. It is wonderful that your dear mum is receiving such excellent medical care. I have thought about you and her of late....still praying for you both. This recipe does sound delicious, Kitty. Kitty, between you and her very unusual doctor, your mom is getting such wonderful care! Hope she is all better soon. I love date nut bread, but haven't made it in years; how did that happen?! Must remedy it soon. Hi Kitty, oh I do hope that your mom makes a full recovery with her health! This date bread looks and sounds so delicious. Thanks for sharing this at our Cooking and Crafting with J&J! I think you found the perfect spot there next to the fireplace. I have sure flipped ours on lately! In fact ours looks just like yours. I love your Pine Cone pieces! Darling and the date nut bread looks amazing. Thanks for sharing and participating. Oh Kitty, I am so sorry to hear about your Mama. may she heal quickly and feel better. I know it was tough to leave her. 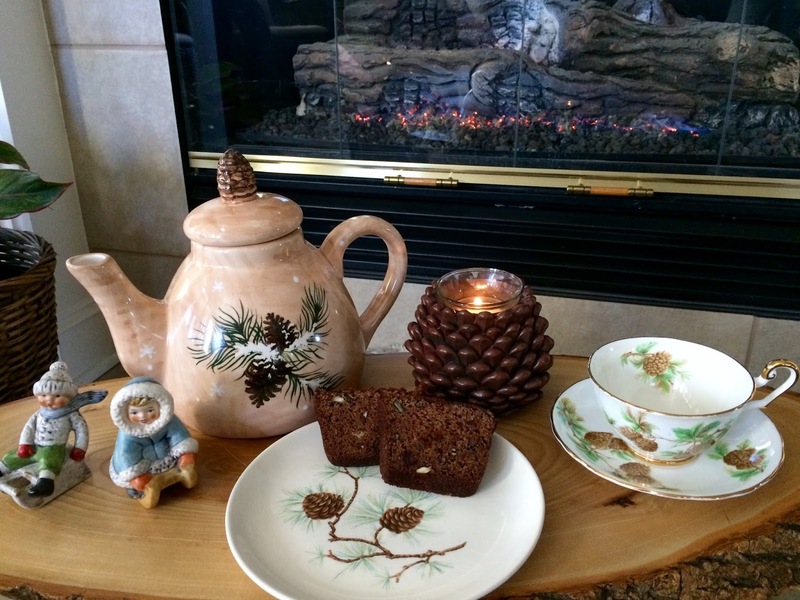 Your Date nut bread looks lovely, with with the pinecone china. Take care. Welcome home, Kitty. I'm sure you are torn between being home and being with your mom. I'm glad she's on the mend. Date loaf is a favourite of my husband's and I make it a couple of times a year. No nuts for him - he doesn't like the texture. Such a fussy man (really, he is not). Looking forward to making this bread - and your dishes are divine! Get well soon to your mom - so wonderful to have such personal care! I just became your newest follower! I am sorry to hear about your mothers accident, and a speedy recovery. Your date nut bread is just the perfect thing for a wintry day. Kitty, how wonderful that your mother's doctor visits her at home! That must be a big blessing. I hope that you have time to re-energize now that you are home. That date nut bread looks delicious and love the "snowy" cottage. Is it too pretty to eat? Um... yes and no! Lindas imagens. A louça é lindíssima e o bolo parece delicioso. Feliz fim de semana. OMG ..Teatime doesn’t get any cosier than this .... So sorry about your little ‘ Mother” ..It’s always such a worry...however how wonderful that the doctor makes home visits... I’ll be sending some healing teatime prayers her way. Enjoy your week-end!!! Kitty, I am so sorry about your dear mother! I hope she gets better quickly! 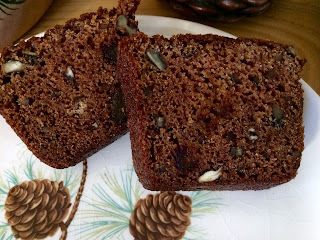 I love date nut bread and can't wait to try your recipe! Thanks for sharing it with SYC. 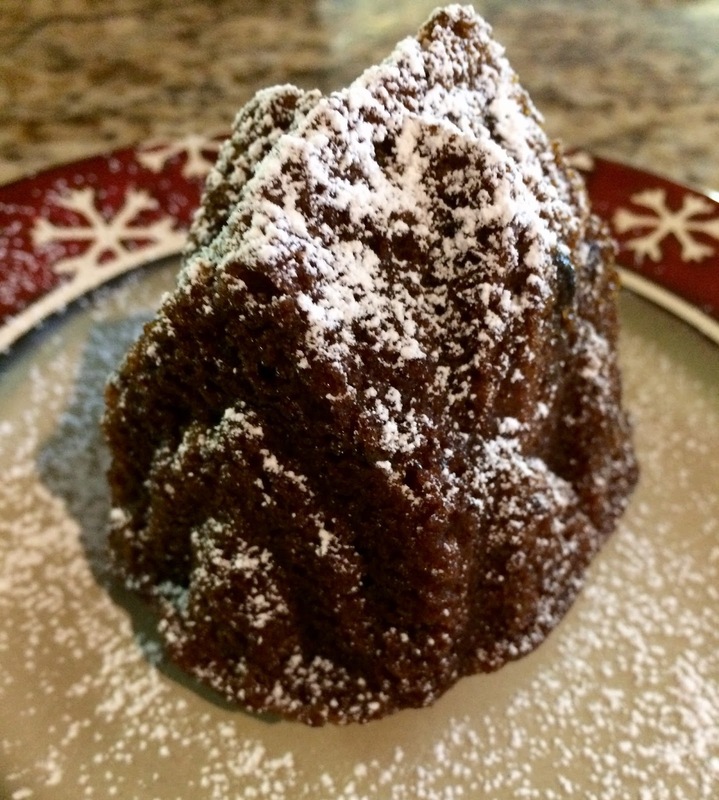 Your post is featured on Full Plate Thursday this week and I just pinned it! Thanks so much for sharing with us and hope you will come back soon! I'm so sorry to hear that your mom has pneumonia in addition to her broken shoulder! I'm sure you hated to leave her! I've been thinking about the both of you and will pray for her recovery. Your date and nut bread looks wonderful. I really love the mini cottage bundt version. 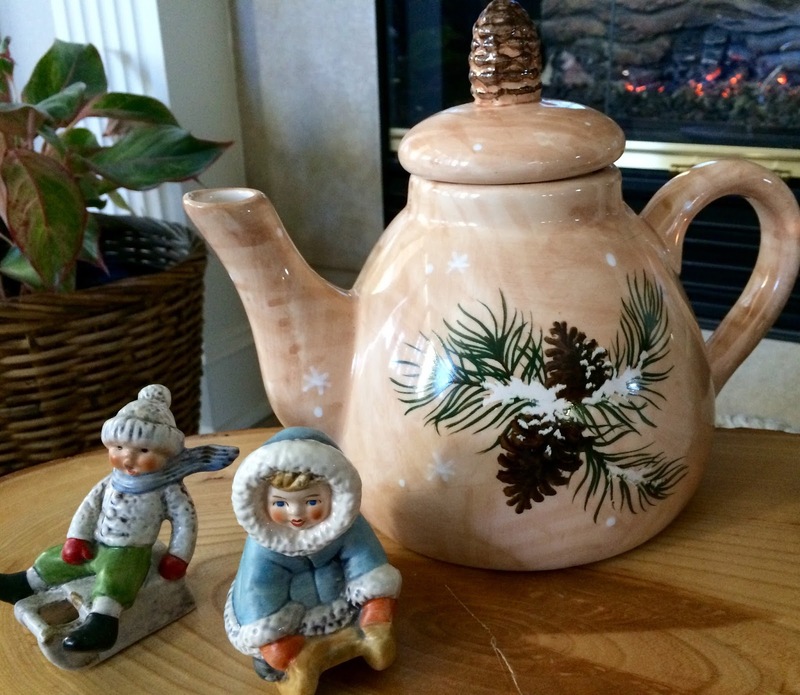 :) Your teacup and teapot are perfect for this time of year. Enjoy your tea and bread, my friend. So thankful that your visit with your mom was a blessing to her, to help her recover from the two illnesses! That date and nut bread really looks delicious, it almost looks like it has chocolate in it! Sprinkling powdered sugar on anything just makes it taste better I think :) Hope you are doing okay through the winter months... hugs!